Summer is well and truly on its way now and if last year was anything to go by then we are in for a lot more bumps and bruises now! With the hot weather we tend to get out a lot more and inevitably that means there are more accidents where children hurt themselves while playing. It happened to D a lot last summer (the sun seems to bring out his clumsy side!) so when I was contacted about TheraPearl Pals which are little animal shaped hot or cold therapy packs which are perfect for children I knew it was something that we needed to try! TheraPearl Pals are designed with children in mind. 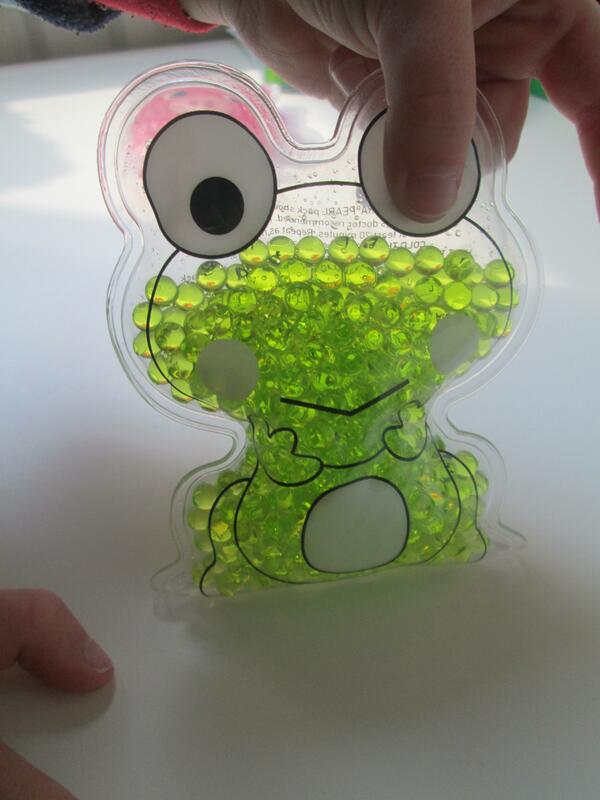 They are little animal shapes hot or cold pads which can either be frozen in the freezer ready to be used as an ice pack or they can be heated in the microwave and used as a heat pad. 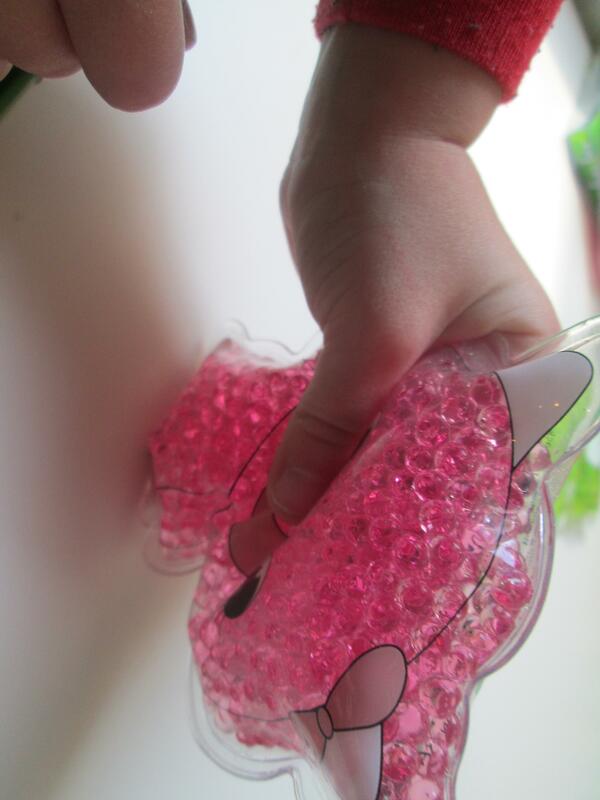 The TheraPearl Pals have little pearl type squishy beads inside which are various colours (to match whichever animal they are made to be). The pearls are designed to retain the hot or cold temperatures for up to 20 minutes and the funky animal designs are used to help keep children calm and stop fidgeting while the pals do their job. The other great news is that the TheraPearl Pals have been verified to be free of heavy metals, lead, BPA and phthalates. Not only that but the pals are reusable, hypoallergenic and designs to not leak or drip when used! Personally we didn't use them in the microwave for two reasons, the first is that it has been lovely weather here for the last 2-3 weeks and the other is that we don't actually own one! I can however see the advantages the heat pad would have in the winter as you could easily pop them inside a child's coat pocket on the way to nursery or school to fight off the chill along with the many other uses for a heat pad. 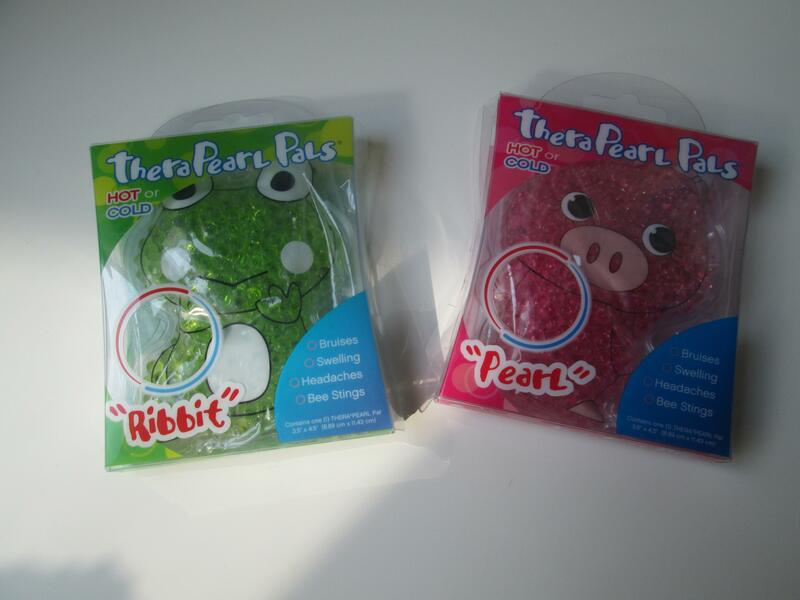 The TheraPearl Pal range has a variety of animal shapes and we received the frog called "Ribbet" and the pig called "Pearl". D loved them from the minute I opened them and was very interested in helping to get them ready to be used. He took both and helped to put them in a safe place (in the freezer drawer). They didn't actually manage to stay in there for too long since D had a little accident at nursery the next day just before home time. 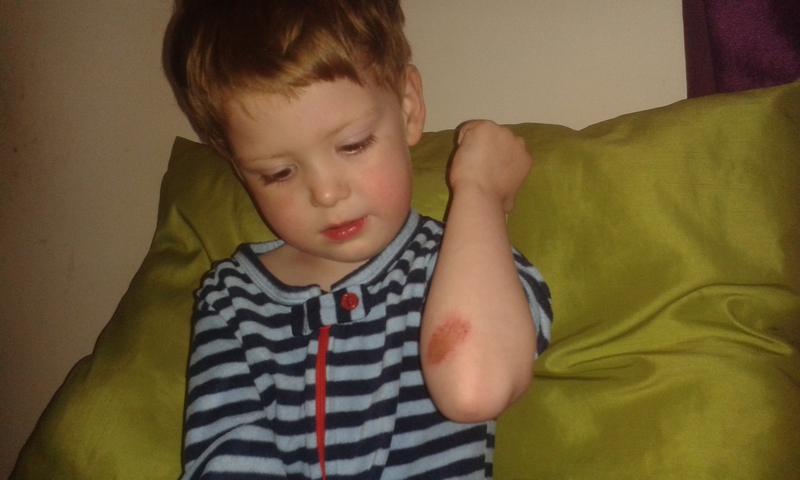 He managed to scrape his arm while playing. 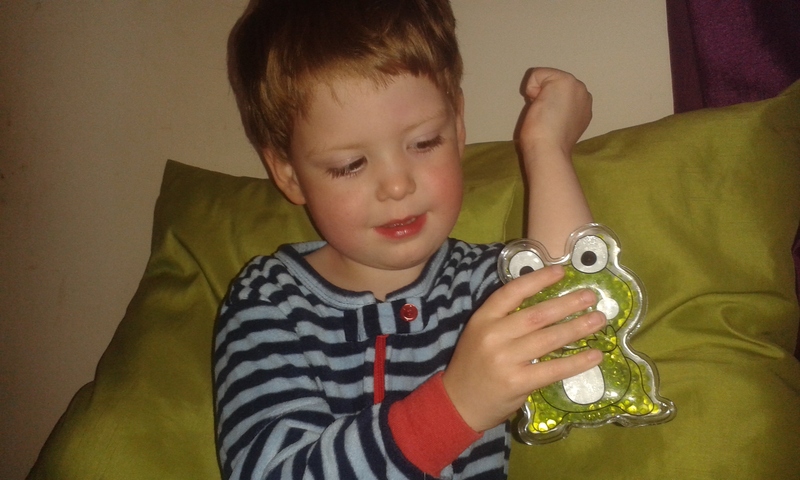 The minute we got home he got his pj's on and wanted to use "Ribbet" the frog to help the stinging stop. I was pretty impressed with the temperature of the TheraPearl Pals when I took them out of the freezer! They had been in there for almost a full 24 hours and they hadn't actually frozen (which they are designed not to do) but they had become cold enough to retain the colder temperature for at least 15 minutes. Which is as long as D was willing to use them for! One big advantage of the TheraPearl Pals using the pearls inside is that the pearls are small and easily slide over and around one another and as you can see there is plenty of room in the pack for them to do so. This means that when they are applied to the skin the whole pack is completely flexible and can be bent or moved to a position where it can really reach any area a child might hurt and there is no need for any further ice or heat pads to be used! The other advantage this feature creates is that anyone is able to use the TheraPearl Pals making them the perfect addition to practically any home or first aid kit. The pals themselves are the perfect size for little hands to use. Usually if I have had to use an ice pack for D they are big, bulky and actually have a fair bit of weight to them which means I end up sitting there to hold it in place hampering his ability to do anything and it gets quite frustrating for us both! Now D can happily sit for his 15-20 minutes while watching some TV or playing with a car to pass the time. He seems calmer and actually benefits more since he isn't trying to move the body part that hurts! As you can see in the image above D is able to squeeze the TheraPearl Pals quite easily which means he can comfortable lift the whole pack up and place it where he might need to use it since the size and weight are much smaller than that of any ice packs or heat packs we have used before! I also used the TheraPearl Pals over the last few weeks, although not for the initial use they are intended. There have been times while the weather got much warmer when the itching (due to my obstetric cholestasis) got unbearable and not much would help. 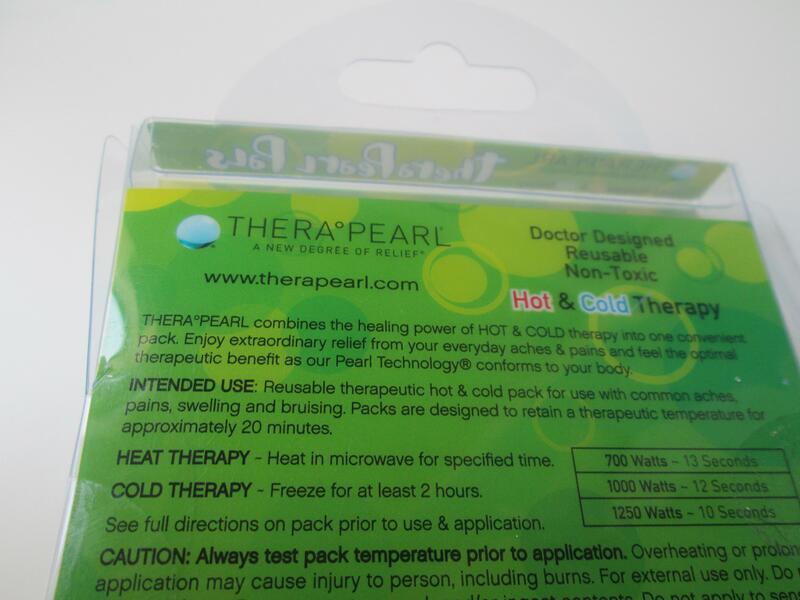 I actually figured out that by using the TheraPearl Pals over the areas that itched the most (usually my legs or feet) I was able to cool down enough to reduce the burning feeling which always accompanies the itching! I have since been using them almost every night when it gets very itchy. I would recommend TheraPearl Pals to any family with young children. They are a great piece of equipment to have around the house especially with the warmer weather coming. They are versatile and have many uses while being completely drug free. The TheraPearl Pals have given me piece of mind and allowed D to feel calmer after the shock of getting a bump, bruise or any injury. They really are the perfect addition to a first aid kit and you could even take the pals on holiday with you thanks to their size, weight and the TheraPeals.